KOBE - The moment the babies, cradled in their mothers’ arms, entered the room, a round of cheerful “oohs” and “aahs” gushed from the elderly whose faces until then had been expressionless. Some smiled and some opened their eyes wide as they looked at the babies. “Adorable!” one said, while others eagerly extended their hands in a plea to hold one of the infants. A 75-year-old woman with dementia who often picks quarrels with others gazed affectionately at a baby, while a 93-year-old man who had been drowsy due to medicine to keep him from acting violently made strenuous efforts to talk to another baby. These images from the Shinai elder care facility in Kobe are typical wherever a baby group goes, as organized by the Kobe-based nonprofit organization Mama no Hatarakikata Oentai, according to its staff. The NPO dispatches these baby-mother groups to assisted-living residences for the elderly as well as to schools under a project called Akachan Sensei (Baby Teachers). Many Japanese women quit their jobs after giving birth. In search of work for mothers with infants, the NPO came up with an idea: create opportunities that make good use of babies’ natural capacity to win empathy and warm hearts. The group launched the project in April 2012. 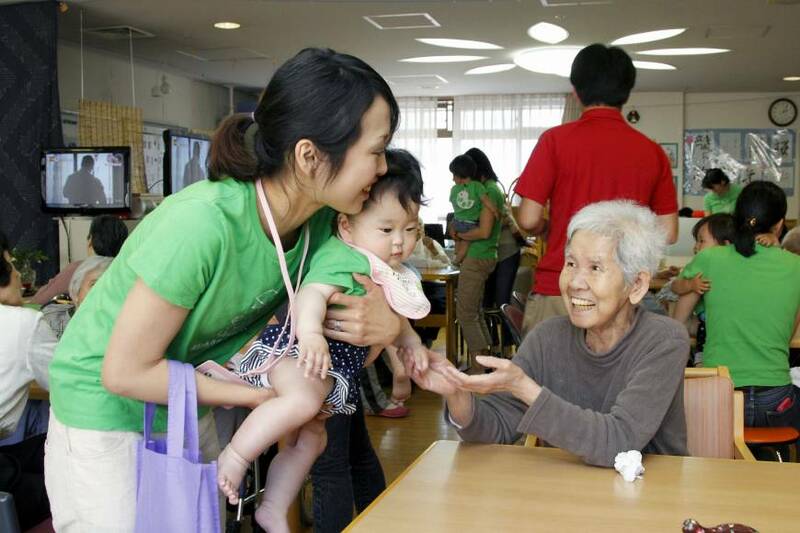 Young mothers are paid some money — a couple thousand yen or more per visit depending on the occasion — for bringing their babies to events at homes for the elderly. Akachan Sensei visits are also made to schools with programs aimed at nurturing appreciation for the value of life and empathy for others. The project achieves multiple goals — bringing smiles to the faces of the elderly and easing the symptoms of age-related illnesses like dementia; alleviating the isolation of young mothers by providing opportunities to interact with others; and even, as some experts believe, helping stimulate babies’ growth. Mother-and-child networks participating in the group’s activities have spread from Hyogo to nine other prefectures, including Tokyo, Kyoto, Osaka and Fukuoka. According to staff at the Shinai elder care facility, all of the residents exhibited calm and relaxed expressions after interacting with the babies. “It seems that even if they eventually forget about the babies per se, they still remember that they had a good time,” one staff member said. Perhaps reminiscing about the times when they themselves raised children, many of the elderly were moved to tears when they were with the babies. Some also became more kind and gentle to staff members at the facility. Among the mothers who took part was 29-year-old Ami Seimatsu, who visited with her 1-year-old daughter. “My life had become just about raising my child and I wanted to change that,” she said. Her baby was shy around strangers in the beginning but soon got used to it. The impact on an individual from interacting with babies differs depending on factors such as child-rearing experience and gender. Still, experts believe that in many cases there are benefits of varying degrees. “While no medical evidence has yet been established, it is known that many people with dementia calm down when they spend time with young children,” said Hidetoshi Endo, head of internal medicine at the hospital of the National Center for Geriatrics and Gerontology in Obu, Aichi Prefecture. “Watching grandchildren grow, even those of others, brings hope and ambition for the future and thus empowers everyday life,” Endo said, pointing out that a growing number of facilities for the elderly are being established alongside day care centers for young kids. Some experts believe that the babies also benefit from interaction with the elderly. “Unlike most other primates, human beings have evolved into a species where multiple adults — not just the mother but also the father, grandparents and others — are involved in raising children together,” said Masako Myowa, an associate professor of developmental science at Kyoto University. “Opportunities to interact with the elderly are extremely natural as well as important for a baby’s growth,” Myowa said.